A large field lined up for the 2015 Fire Road. Asher Swan, find more photos at swan-photography.com. 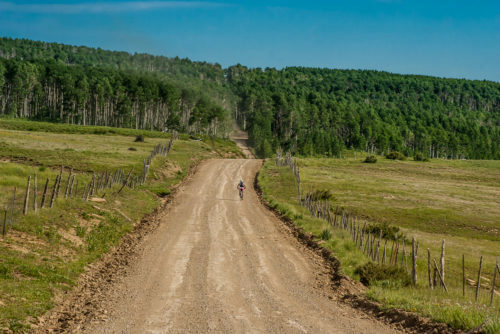 July 25, 2015 – Cedar CIty – The Fire Road is a 100km (60 mile) dirt road race held in southern Utah that has been steadily attracting a larger and deeper list of riders over the past few years. 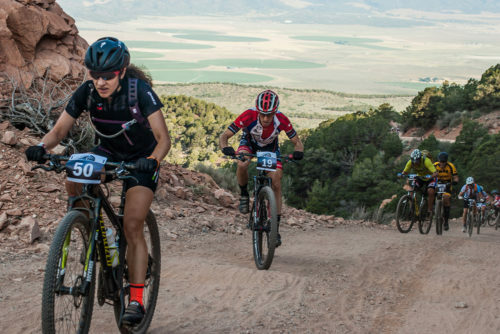 This year saw 326 riders converge from California, Arizona, Nevada, Colorado, Idaho, Wyoming and further afield in addition to the strong showing of Utahns. 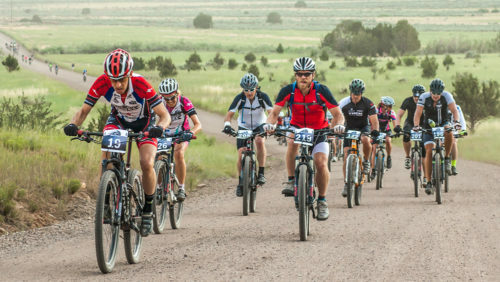 The attractions include a high caliber event with excellent organization and on-course support, a challenging and scenic route, and a good chance to win a gold entry token to the legendary Leadville 100 mountain bike race. Also on offer are shorter distances of 25km and 60km for those not wanting to obliterate themselves on the 100km route. The Fire Road has tough climbs and awesome views. Photos by Asher Swan, find more photos at swan-photography.com. This year the event was brought forward by a week to avoid clashing with the July 4th holiday weekend, and to coincide with Cedar City’s annual music and arts festival. GrooveFest took place in the main park in Cedar City, which is where the race also finished, providing non-riding family members with handy entertainment. The race start this year was brought forward one hour to 7am in response to the predicted hot temperature for the day. Volunteers at aid stations around the course did an awesome job, and were supported by extra volunteers out on course handing out waterbottles from roving ATV’s. There was no excuse for dehydration! Back this year to defend his overall win from last year was Leroy Popowski from Colorado. A renowned hill climber, Leroy grew wings on the days first big climb to open up a 4 minute gap on a talented chase group, earning the KOM award for his effort. No slouch on the rollers, Leroy maintained his lead for 90 out of the 100km, when he was caught and passed on the extremely steep and sketchy gravel road descent back down to the edge of Cedar City. Leroy was riding it conservatively, valuing his skin. Not so the chasers. Justin Lindine of Ogden out-powered John Gaston from Aspen to take the win by 6 seconds in a time of 3 hr 49 min, with Leroy rounding out the men’s open podium. In the open women’s division, Julie Dibens devastated the other female competitors, and almost all of the men to come home in 13th place overall with a time of 4 hr 11 min. It helps to know that she is a British pro triathlete who lives and trains in Boulder, Colorado, and has multiple world championship titles in the Xtrerra and 70.3 distance events to her name, as well as being an Olympic athlete. Did I mention some serious talent shows up to this event? The bad luck award surely went to the guy who drove from Minnesota to compete, but incurred a separated shoulder in a fall pre-riding some of the course the day before, and was facing a long drive home with one arm in a sling, and no finishers belt buckle to show for his pain. in Cedar City. Photos by Asher Swan, find more photos at swan-photography.com. What was a superbly orchestrated event had an unfortunate blip for the 100km riders when the race director made the difficult decision to move the awards ceremony and Leadville qualifier selection forward by 2 hours to avoid a forecasted direct hit by a heavy duty thunderstorm (which fortunately never materialized). Many of the award recipients were not present, being offsite showering or resting up after this tough ride. As there was no mechanism to communicate the schedule change and the awards were all over by the advertised time, there was disgruntlement and disappointment about the decision.